Lucasfilm and Industrial Light & Magic (ILM) officially announced the company that they have selected after what they call an “exhaustive testing process” to do the conversion from 2D to 3D for the first movie from the Star Wars saga and that company is Prime Focus. 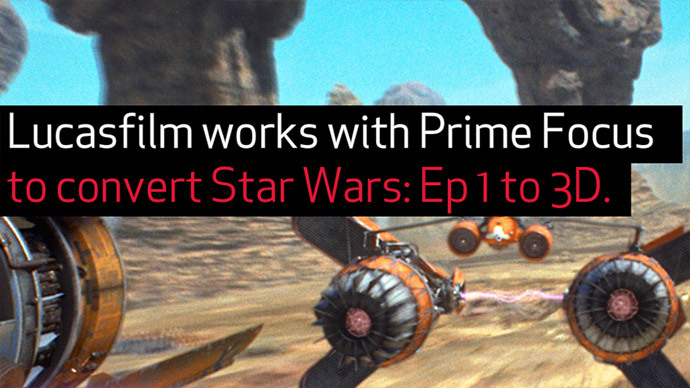 Utilizing Prime Focus’ proprietary View-D process for the conversion the new release of the Phantom Menace is scheduled to hit 3D theater screens on February 10, 2012 is everything goes as planned. There is enough time for a really good conversion, so we can only hope that Prime Focus takes the time and does its job very well, because otherwise the relaunch of Star Wars Episode I in 3D can turn out to be a total disaster. Prime Focus has worked on films such as Avatar, Shrek, Tron: Legacy, Narnia: Dawn Treader and most recently Sucker Punch. The extensive conversion process is being done under the close supervision of John Knoll, Visual Effects Supervisor for ILM, and with the positive feedback from George Loocas who apparently sees very convincing results with the conversion to 3D we can hope for the best, but also prepare for the worst. We all knew this was coming, a 2D to 3D conversions of the all 6 movies from the Star Wars saga, we just needed to get the final confirmation coming from George Lucas and that has finally happened. What he was waiting for was the number of 3D screens to become enough for a major release like that, and Lucas wants to have the 3D versions of the movies shown on pretty much every 3D screen available when they launch. 20th Century Fox and Lucasfilm have announced 2012 as the target year for the theatrical launch of the Star Wars series in 3D, starting with the Star Wars: Episode I “Phantom Menace” as the first movie of the saga to be released. George Lucas know that good conversions from 2D to 3D take time and he is prepared to do it the right way in order to achieve really good results in the conversion, so that the 3D versions of the movies will be made as good as possible. We’ve already seen some rushed 2D to 3D conversion for movies that in the end were quite disappointing, but taken enough time and resources you can make a 2D movie look almost as if it was really shot in 3D. And with old movies that were shot years ago like all the six episodes and especially the first thee Star Wars movies you can’t just go and reshoot them in 3D, the only way is to do a good 2D to 3D conversion. So are you going to go and watch the Star Wars saga in 3D, although it will be a conversion in 2012?